At the age of 16, Tuna Bilgin has received appraisal from masters and performed at prestigious halls. Tuna Bilgin, a piano child prodigy, is outperforming most in his age category with his piano-playing skills. Although he is 16, the young musician charms even master artists. State artist and world-renowned pianist Gülsin Onay called him "a genius talent," while art critic Şefik Kahramankaptan said about him, "The boy plays better than his age promises." At such a young age, Tuna Bilgin has already started to score with art circles. Tuna's interest for music started with the support of his family. Studying as a prep school student at Bilkent University Faculty of Music and Performing Arts, Tuna has won prizes at many competitions and performs piano recitals at grand halls despite his young age. Tuna's journey starts with the first orchestra concert he gave in İzmir province at the age of 12. Performing three sections by Mozart, the prodigy mesmerized the hall and attracted the attentions of art circles. Speaking to Anadolu Agency (AA) about his interest in music, his first encounter with a piano and his dreams for the future, Tuna stressed that family support is the best source of motivation for him. "My father's interest in Turkish music enhanced my interest in music. His keyboard was the first musical instrument I saw. Even my toys were musical instruments. I started to take piano lessons from associate professor Cemile Cabbarova when I was 7. I took the exam at Bilkent University Music Preparatory School in 2013 and enrolled in the classes of professor Gülnara Aziz." 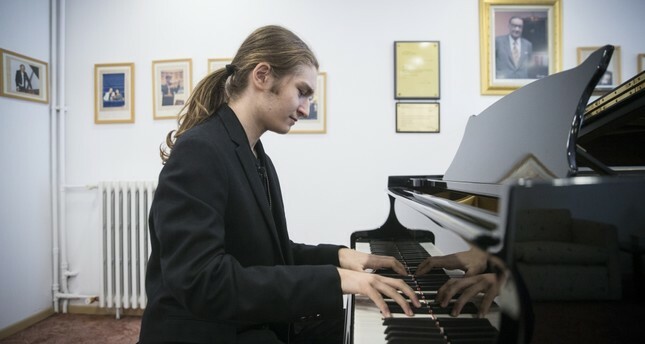 Reiterating that he came in first at the First Mozart Academy National Piano Competition in 2013, Tuna said: "In 2015, I took part in the 1st Ahmet Adnan Saygun Piano Competition which was held in İzmir under the chairmanship of world-renowned pianist Gülsin Onay. I came in first. That competition became a cornerstone in my life. There, I met famous artists. Also, at the 4th Adnan Saygun Piano Competition presented by the 14th Gümüşlük Music Festival in August 2017, I came in first in category ‘B' and won the Prize for ‘Best Adnan Saygun Exponent.' In 2016, I was invited to the International St. Petersburg Music Festival, and it was a great experience for me to play with world-renowned figures." Tuna explained that the people who are good at music must go to conservatories and develop themselves, and added: "I think it is important to spend five to six hours practicing in a day. Practice is extra important for those who are busy with music, I think. My biggest dream is completing my university education abroad and to teach what I learnt there to others in my country." Tuna's father Sami Uğur Bilgin also stated that as a family, they have always had an interest in music and will always support Tuna. Noting that Tuna has been interested in music since a young age, Sami said: "Music was always a part of our life. For example, my grandfather Mr. Sami [the grandfather of my mother's family] had pieces released on the radio. My musical journey started with my grandfather's oud. I'm interested in Turkish music as an amateur. Before the age of 1, Tuna started getting familiar with musical instruments. In fact, it was not us who directed him to music, he was the one who explored his skills. Even when he was a baby crawling on all fours, he used to play with my keyboard and Turkish classical instruments. All his toys had something to do with music." Stating that Tuna moved to Ankara for his music education in 2013, Sami said: "One day he came home after school and wanted me to buy a piano for him. That is how our piano journey started. We met associate professor Cemile Cabbarova in İzmir, and he took special classes from her for about three years. When he got rank at the Mozart Academy International Piano Competition in quite a short time, we understood that things were getting serious. Those days, Tuna cemented a world made of music for himself. As a family, we decided that if he would pursue his piano education, he must learn from the best masters and under the best conditions. We left our family who lived in İzmir for 50 years and moved to Ankara for the future of our son." Sami stressed that his son is lucky to have a quality music education and said that there are so many skillful children in Turkey like his son, Tuna and they are waiting to be discovered. Explaining that Tuna follows an intense schedule, Sami added: "He is also working to develop himself as a composer. His life is music. Tuna lives the phrase ‘The one who loves his work, doesn't go to work.' By nature, he is programmed to make music. Our life has also changed so much with Tuna. I received a piano tuning education for four years thanks to him and I became a half-master. Now, I prepare his and his friends' pianos."